MySQL is an open source relational database management system that has experienced a phenomenal growth in popularity and use. Known for its speed and ease of use, MySQL has proven itself to be particularly well-suited for developing database-backed websites and applications. In MySQL, Paul DuBois provides a comprehensive guide to using and administering MySQL effectively and productively. He describes everything from the basics of getting information into a database and formulating queries, to using MySQL with PHP or Perl to generate dynamic web pages, to writing your own programs that access MySQL databases, to administering MySQL servers. The fourth edition of this bestselling book has been meticulously revised and updated to thoroughly cover the latest features and capabilities of MySQL 5.0, as well as to add new coverage of features introduced with MySQL 5.1. Note: Appendixes G, H, and I are located online and are accessible either by registering this book at informit.com/register or by visiting www.kitebird.com/mysql-book. The unexpected pleasure of reading books about databases is that they are often written by authors with highly organized minds. Paul DuBois and his editors at New Riders have assembled MySQL with a clarity and lucidity that inspires confidence in the subject matter: a (nearly) freely redistributable SQL-interpreting database client/server primarily geared for Unix systems but maintained for Windows platforms as well. What isn't "free" about MySQL (the application) is its server's commercial use; all clients and noncommercial server use are free. DuBois's tome isn't free either, but its list price is modest in light of its value and the value of its namesake. The first third of MySQL is an excellent instruction tool for database newbies; the second third is a detailed reference for MySQL developers; and the last third consists of clearly annotated appendices, including C, Perl (but not Python), and PHP interfaces. Perhaps as an indication of the collective will of the developers of MySQL, DuBois does not separate Windows 95/98/NT design or development specifics from its main discussions. Platform-independent design is a goal, not a reality, and users will have to rely on newsgroups and mailing lists for details. Moreover, security issues are addressed in a mere 18 pages, a large part of which is devoted to standard Unix file and network-access permissions. Next to nothing is mentioned about defense against common hacking strategies, the use of secure shell interfaces, or access encryption. This book has been super useful.I was new to development with MySQL and among the 3 or 4 MySQL books I got, this is the go-to book I use.It's very thorough, explains things clearly, and has lots of concise examples to show statements in use.Highly recommend it. I haven't had a chance to go through the entire book but based on what I have read so far all the information that I need to setup, maintain and access data through a MySQL database seems to be there. I would recommend this for folks new to MySQL. Top Notch book on MySql.Clearest and best explanation of SQL I have ever read. Great book, describes from Beginner to Moderate-advanced topics. This could be considered "the" manual for MySql. Great resource for learning the ins and outs of benchmarking a typical cms with a mysql db. This is just the best book I've read about creating software, that needs high availability and high scalability. 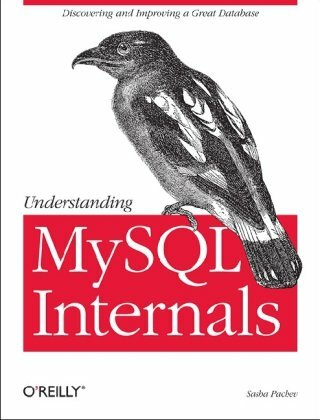 You think, this is book is only about MySQL? Surprise! It's not, actually. Yes, some details apply only to MySQL, but common technical things such as data sharding, caching, clustering etc. can be applied to any software. Reading this book I've learned like I read about 10 different books on the subject. Highly recommended! It's a pity there is no Russian translation available. Good book, with detailed explanations, but it could get more detailed (that's why only 4 stars and not 5). It's a good start point into high performance tunning, but not a deep into every concept, which is not possible in a single book. The book dives into some benchmark, optimization of queries, the capabilities of every storage engine, and also its weaknesses, some compared backup strategies, replication, and master-slave configurations, all well explained, up to MySQL 5.1, but with new versions in mind. I enjoy this book, although some concerns are hard by nature, and some kind of query optimization could be more graphical to better understanding. Very useful... just very useful. PHP and MySQL Web Development shows how to use these tools together to produce effective, interactive Web applications. It clearly describes the basics of the PHP language, explains how to set up and work with a MySQL database, and then shows how to use PHP to interact with the database and the server. This practical, hands-on book includes numerous examples that demonstrate common tasks such as authenticating users, constructing a shopping cart, generating PDF documents and images dynamically, sending and managing email, facilitating user discussions, connecting to Web services using XML, and developing Web 2.0 applications with Ajax-based interactivity. The fourth edition of PHP and MySQL Web Development has been thoroughly updated, revised, and expanded to cover developments in PHP 5 through version 5.3, such as namespaces and closures, as well as features introduced in MySQL 5.1. The PHP server-side scripting language and the MySQL database management system (DBMS) make a potent pair. Both are open-source products--free of charge for most purposes--remarkably strong, and capable of handling all but the most enormous transaction loads. Both are supported by large, skilled, and enthusiastic communities of architects, programmers, and designers. PHP and MySQL Web Development introduces readers (who are assumed to have little or no experience with the title subjects) to PHP and MySQL for the purpose of creating dynamic Internet sites. It teaches the same skills as introductory Active Server Pages (ASP) and ColdFusion books--technologies that address the same niche. Authors Luke Welling and Laura Thomson's technique aims to get readers going on their own projects as soon as possible. They present easily digestible sections on specific technical processes--"Accessing array contents" and "Using encryption with PHP" are two examples. Each section centers on a sample program that strips the task at hand down to its essentials, enabling the reader to fit the process into his or her own solutions as required. Tables that list options and other nuggets of reference material appear as well, but the many examples and the authors' commentary on them take center stage. I suggest getting a beginners PHP book before this because all it is in the beginning is a crash course, but everything after the first couple of chapters is right on the money! Very good book worth buying. Bought it about a month ago. Havn't finish reading it all yet but i'm already able to write practical web sites. The book is well organized, written profesionaly and easy to follow (altough here and there minor editing are still required). I had some background in programming (Java) and HTML which i belive made it alot easier to fully understand the first part: "using PHP". Had absolutely no background on MySQL and thanks to this book i have a good understanding of it. Bottom line, couldn't ask for something else. If you have basic background in programming, meaning, you already wrote some code lines, this book is the one for you! The book is great to start programming in php. Why not Jquery, instead of YUI? This is just disgraceful. Were the people who gave this book great reviews, already well-versed in PHP, to be able to catch the errors. Did the people who gave this book great reviews actually do the examples? Were they paid by the O'Reilly to give the book good reviews. I bought this based on the reviews, and it was okay, but not great. The first few chapters were very helpful, but I had problems getting the examples to work, even when I pulled them from the publisher site. This book has great potential, and I did learn a lot from it, but was disappointed the further I got into it. I've been teaching many people how to write PHP code at [...], and I have to say that this is one PHP book that is a great reference for learning PHP. Although I didn't buy it through Amazon, a friend of mine showed me his, and I am actually quite impressed. When did PHP 6 get released? It is 2010 and the latest stable release of PHP is 5.3.x. Stick with Apress or O'Reilly publications. This book is for PHP 6 which... does't exist.The description says "PHP 6 (due out in 2008). "It didn't come out in 2008.It hasn't come out in 2010.No one knows when it will come out.This is a technical book about a non-existent technology. I used this book in college. The book isn't that bad but the examples can be hard to understand because the entire book has a "Two-Column" design. Basically, every page is split into two columns. Its hard to read code examples when they are split into different columns and then spread over different pages. My book also split right in half in the center of the book. The binding came unglued and fell aprt. I contacted my college book store and they were going to replace it for me. Upon looking at the rest of the books on the shelf, the bookstore manager noticed that those books were also falling apart in the center. It appears there are too many pages for a paperback book, and the book was not glued very well. If you buy it, don't plan on it lasting very long. 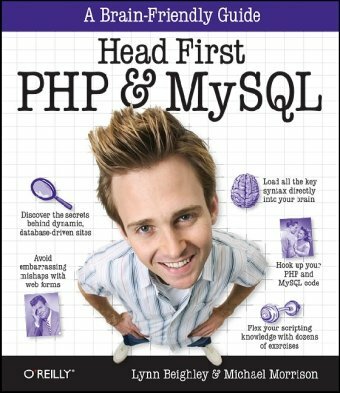 I was simply looking for a book to teach me the basics of PHP and MYSQL. This book is amazing! It's just what I needed and I am already mastering php on page 50 of 600. Every day I work through this book and what would usually be a chore is really fun. The guided code tutorials and the way in which this book is teaching me is excellent, it's like having a personal tutor. This book is teaching me in a way in which I can understand and most importantly enjoy :D.
This book is a necessary but not entirely sufficient resource if you plan to complete the 5.x developer and/or DBA exams with self-study.Most of the subject areas present on the exams are covered in enough detail to easily pass if you are experienced with another database product and can apply that experience. (FYI, I have 15+ years working with Oracle/SQL Server and have dabbled with MySQL since 3.x, passed all 4 exams using this guide). That said, you will likely need to supplement the book by reading the MySQL documentation if you wish to get as much knowledge as possible from the study process.Certainly try out each command on a test MySQL instance multiple times using version 5.x (NOT 5.1 where some behaviors have changed). The practice questions provided are not all in multiple-choice format as you will encounter on the exam, which can be a good mental exercise for review, but the answer formats can be frustrating in some cases, as in the case of a multiple-choice question with five possible letter choices, wherein the answer is a paragraph that doesn't indicate the correct letter choices.Trivial but annoying. Be sure you complete all practice questions from the accompanying CD and understand why your answers were right or wrong.There are no labs or practical exercises included, although a sample schema is included from which many of the practice questions are drawn. If you are not taking the exams, this is still a good primer on MySQL. 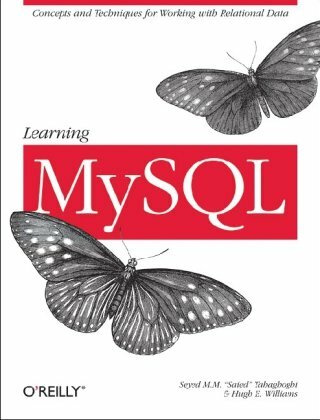 If you need to learn MySql, this book is a very good choise, easy to understand, good and clear examples step by step, no just the query they show the query and the response from the server, not like another books that only show the query but don't show you the server response, you must guest or try and try. I have been a J2EE Architect/developer using DB2/ORACLE for many years. I always feel that I am lacking in DB so I thought lets do DB certification and I chose mySQL. I have been using mySQL at home for my learning and in this book I found many interesting things that I was unaware. The book has every detail of topic that I need to prepare for the exam. The book is great not only to get certified, but also to learn about NySQL. It is written in such a manner that you need not to be experienced with the software (I advise you though, to be familiar with it prior to making an exam). The book is great, CD examples are great, also comes with test evaluations. Only drawback is that the exams are expensive. This book is a very comprehensive guide to what MySQL offers and can teach you. Which are my top ten fastest-selling products? How frequently does this person come to our facility? What was the highest, lowest, and average score of the team last season? MySQL, the most popular open-source database, offers the power of a relational database in a package that's easy to set up and administer, and Learning MySQL provides all the tools you need to get started.This densely packed tutorial includes detailed instructions to help you set up and design an effective database, create powerful queries using SQL, configure MySQL for improved security, and squeeze information out of your data. After covering the basics, the book travels far into MySQL's subtleties, including complex queries and joins, how to interact with the database over the Web using PHP or Perl, and important house-keeping such as backups and security. The authors, Saied Tahaghoghi and Hugh E. Williams, have careers in academia and business, and share a keen interest in research into search technologies. Whether you've never touched a database or have already completed some MySQL projects, you'll find insights in Learning MySQL that will last a career. business experience with seller was good. there was not any kind of problem. book arrived in timely fashion. I recommend doing business with this seller. Soy de Mexico y la verdad es que la calidad del producto ha sido realmente satisfactoria, y en cuanto al servicio de envio mas que excelente. The book is pretty good, and offers lots of examples. MySQL is not very simple, and took me a lot of studying to learn. I found that I had to use several books at once to get the hang of things. One thing that this book does not cover very well are table keys (primary, foreign, etc). this book is a very completed and updated quick look to database world and optimal reference book for sql/mySQL primer. Get this book!This O'Reilly book "Learning MySQL" first appeared in the book stores at the beginning of the year 2007.The book is written by two PhD authors who seem to have thoroughly tried its contents on their students, at RMIT University in Melbourne, Australia.You can buy this book and then create a splendid software career for yourself, programming Relational Databases.And live happily ever after. If you are a total SQL beginner, please also buy a more simple-minded introductory SQL text as well; make you favorite pick among the 20-odd SQL texts available in your local bookstore, or read Amazon's reviews associated with all the other SQL books. Now back to "Learning MySQL".I'm enjoying this book wherever I go, inserting my USB flash drive on any Windows machine I can lay my hands on.I have installed my free copy of MySQL on this low-cost device ($20 for a 4 GigB flash drive), together with Java, Apache Tomcat, FireFox, and other opensource goodies.My point is that this MySQL book covers Windows as well as it deals with Linux and Mac OS X, almost always in the same breath. I typically try out the book's examples at the mysql> command prompt, but my own final application right now happens to consist of Java servlets, talking to MySQL databases, and running in Tomcat under the Java Virtual Machine (JVM), all on the puny USB flash drive without disturbing the particular Windows machine I'm visiting. By following the book's examples I have built up a mental toolbox containing all the standard SQL techniques and all the helpful but proprietary MySQL extensions to SQL.Extensions which you might, or might not, want to assimilate, depending on your purity point of view. As you go through the book's examples on your own mysql> command line, you realize that each example probably in an explanation triggered by questions from the authors' bright MySQL students.It is like sitting in their classroom lapping up the authours' knowledge.And, these authors know their stuff, something that cannot always be said of other SQL books. One feature, among others in the book, is the authors' short but wonderful Chapter 4, where the reader is led by the hand through The Entity Relationship Model, and through the authors' database examples illustrating the super-important topic of How to map Entities and Relationships to Database Tables.There, the authors also point out existing tools to draw ER diagrams, such as the good free tool "Dia", or MySQL's own free "MySQL Workbench program" which is a very powerful visual database design tool, although still in the beta testing phase. Unfortunately, I read "Head First HTML with CSS & XHTML" before I read this one.Perhaps I would not have been so disappointed if I'd read this one first.This presentation is more 'Artsy' than 'Technical'.If you're into buying the 'Artsy' type of books then you'll love this one.For me, well, you should throw away the first 200 pages.On page 200 is a nice tidbit I needed to learn, but the book really begins on page 210, where the first 'rules' are presented, and starts to develop in a 'better' fashion from that point. 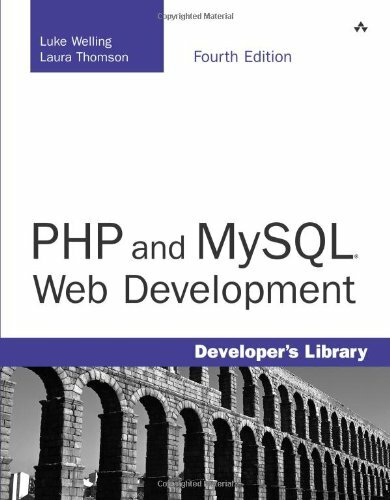 When I buy a book on PHP & MySQL, I expect, want, NEED to learn how to use PHP to grab data from a web page and use MySQL to put it into a database and vice-versa.I don't care about how to send email using PHP, plus I don't care for the way the authors handle email.There are better ways, existing classes that handle it for you, and they're free.I also don't like books that show you a wrong way to do things - anything, and then have you correct it.It tends to implant 'bad' knowledge into my mind that I don't need.You should start with good, solid building blocks, as they did on page 210 and create a foundation.Then you build up from there. I assume, after reading the authors' biographies, that they were probably more interested in completing a cute, artsy, publication that skirts through the subjects rather than a more technically proficient work like the authors of "Head First HTML with CSS & XHTML" did.I gave that one 10 stars out of 5! (Yes, I mean that it was twice as good as I could rate it! )It was the first book I've read cover to cover since high school - Class of '65 - other than a couple of Tom Clancy's novels.I should, in fairness, point out that I am a school trained structured ISAM COBOL programmer, now retired, and trying to learn HTML, CSS, PHP & MySQL on my own.I may be a little more critical of the technical material than most, because I expect computer books to present a logical, organized presentation of the necessary material.This one does not. 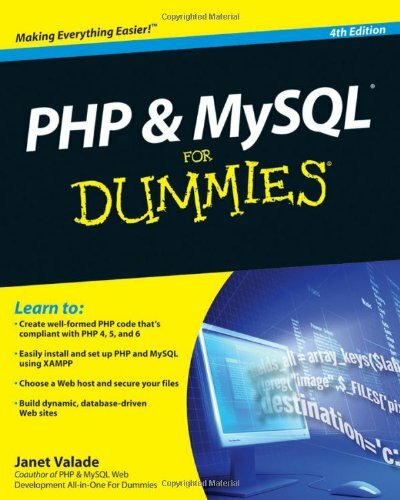 I have been using this book as a work book for learning PHP and MySQL... It is a great book!the format is a little different, but it really works! I would recommend this book to anyone who has a good handle on HTML and CSS and wants to expand their skillset to include server side scripting and database applications.This book is not really geared toward programmers, so I wouldn't recommend it to someone who already knows how to program. I'm a Web Design student, and I got this book for a database class I had to take a little while back. Unfortunately my instructors style of teaching didn't fit my style of learning (in other words I don't learn PHP from a 60 page powerpoint slideshow...). So a friend recommended me this book so that I can just teach it to myself. I gotta say I am very happy with it. For beginners I can't stress this enough how easy this book is and how well it explains everything. I mean the "humor" that the book tries to push is really corny, but once you get past that you can learn some pretty solid principles and easy exorcises that you can apply to a lot of web applications. It mixes PHP and SQL together teaching you the basics of what you need. 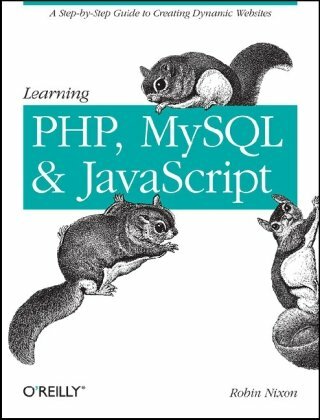 Now this book is not a standard textbook that covers every single component of PHP and SQL but more of learning through some basic exorcises. I personally don't like the soulless and dry text book style books that just present everything in the most boring way. This book tries to mix it up and be a little less serious which in my opinion makes it easier to take in. If you are looking to learn basic PHP/SQL applications then I would highly recommend this book. The more advanced programmer may not find it as helpful however. While "Head First HTML with CSS and XHTML" is absolutely superb, this one is really, really bad.It attempts to mirror the HTML book's style and format but fails miserably.It's disorganized, liberally sprinkled with typos and errors, follows a haphazard presentation sequence, and its colorless pages have all the panache of a two-week old newspaper left out in the rain. Why would someone print on cheap off-white paper and use light gray type to boot? This book, with its pointless distractions placed randomly on every page, is actually hard on the eyes and even harder on the brain. My advise is to look for something better. It shouldn't be all that difficult to find. I bought this book for my wife, a print graphic designer trying to move into web design. She's found it confusing. When she asks me for clarification, it's clear that the authors never really tried out the book on a non-engineer. 1. The first example throws a mailto: link in a web page. My wife wasted an hour configuring her desktop email client (she normally uses gmail) before turning to the next page to see "haha, that's not actually related to anything we want to do". 2. The next example is sending email from a server. This would have been a great example ten years ago, when you could actually get mail out from a random machine without it being discarded as spam. 3. SQL statements are displayed without semi-colons. It's mentioned once, but this book is supposed to be for beginners. 4. The first example of SQL is vulnerable to SQL injection. Fine, it's the first example, but at least say it isn't suitable for production code. 5. Later on, they talk about SQL injection, but the solution they give is to remove unsafe characters, rather than the preferred method of parameterized queries. These are a handful of specific problems I've seen. I'm sure there are more. In general, it's mostly written to the level of a beginner (which I wanted), but it has too many errors in the details for a beginner to actually follow along. To be on the cutting edge, Web sites need to serve up HTML, CSS, and products specific to the needs of different customers using different browsers. An effective e-commerce site gathers information about users and provides information they need to get the desired result. I am very pleased with the condition of this book, it was better that I expected.When I first ordered it I was expecting a delivery date of 5 to 6 working days out, but was given much longer delivery time of about 3 weeks.If you needed a book sooner, this would not be the way to go.However; that being said, it arrived about a week earlier.Overall I am a happy with my choice to get a used book through this vendor.The condition was like off the book shelf at a store. This book is an excellent tutorial for someone who already knows how to program and wants to learn PHP and MySQL.It describes many of the callable functions available in the language, but it tells you to go to the PHO web site for a complete list of all the functions and features.The reason I bought a book is so that I can have the book open in front of me and not have to jump back and forth to the web site to look stuff up. I was a dummy -at least about PHP and MySQL. I know HTML fairly well. I'm not a hacker but I am usually a power user on the apps I use. I just didn't know much about PHP and MySQL so I needed a good feel for the overall scheme of how these two fit together and what that meant for site design. While this book has a good scope, it was just a step or two above the dummy level and that proved an obstacle for me. I found the OReilly Head First book on the same topic a much better introduction. The OReilly books do a lot of basic hand holding so I expected it would take longer but I found that in the same amount of reading and doing time I learned much more about the important skills and concepts and also have a very good understanding of the big picture regarding design. 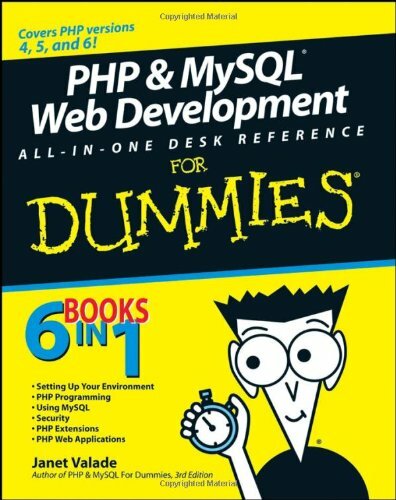 I now use the Dummies book as a reference, so it is indeed useful, but I thought the Title "...For Dummies" a little misleading if this is your first foray into PHP and MySQL. If you skim the verbiage, scout the chapter titles, read the section headings and review the code, you will very quickly understand php and the interaction with mysql. This book will not teach you html.Go read that book. This book will not teach you sql.Go read that book. This book gives you a sequential and an object method of programming against a database within HTML. Each example builds to the following example, until you have the final piece of programming demonstrating the concept. The only addition the author could make is strip the book down into a php and mysql 10 minutes per chapter type of book. To help you be more efficient in your work, this handy pocket reference gives you instant reminders on how to use important MySQL functions, especially in conjunction with key parts of the LAMP open source infrastructure. This powerful database system is so rich in features that no administrator or programmer can stay familiar with all of them. MySQL Pocket Reference is an ideal on-the-job companion, well organized to help you find and adapt the statements you need -- quickly. You don't have time to stop and thumb through an exhaustive reference when you're hard at work. This portable and affordable guide is small enough to fit into your pocket, and gives you a convenient reference that you can consult anywhere. 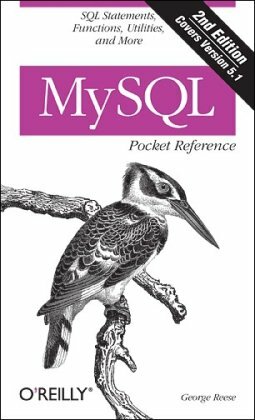 When you reach a sticking point and need to get to a solution quickly, the MySQL Pocket Reference is the book you want to have. I've always liked O'Reilly books, and this is no different.It's a small no-fluff reference that makes for a good read as well.The book is physically small enough to fit unobtrusively in your laptop bag without causing too much of a bulge. Since it is written as a pocket reference, it of course doesn't have all the commands or even all the variants/options for commands.What is does have are the commands and syntax that you are likely to use the most with some good examples. Just know what you are and are NOT getting.It's not a bible, a step-by-step, or a cookbook.It is (as it is labeled) a pocket reference, at which it excels.Highly recommended. Explanations are accompanied by tables and examples for maximum efficiency. George Reese's MY SQL POCKET REFERENCE 2ND EDITION covers Version 5.1 and provides SQL statements, functions, and insights into its variations and utilities. Explanations are accompanied by tables and examples for maximum efficiency. Reese hits a solid triple to start the inning off and scores easily on the wild pitch thrown by the reader who says that the GRANT section is wrong. 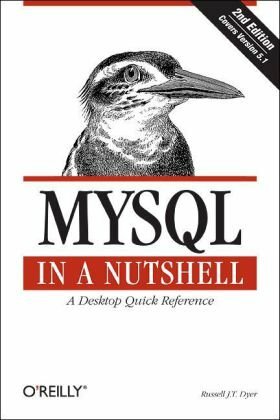 This book works easily and appropriately at your deskside.I found the book to be a very simple, easy-to-navigate reference text that presents the most important aspects of MySQL in the quickest, most logical manner. It is very easy to thumb through with every possible random page landing at a topic of interest.In a way, it was like working with a familiar dictionary, you know the kind, where you just kind of naturally crack it open near the word you're accessing and flip a couple of pages either direction to arrive at the exact reference location. In that vein, I'd perhaps recommend that the margins contain "bread crumbs" telling us where we are in the book, but it isn't necessary since thicker sections often obviate themselves with just another page turn.Each page does have the chapter title in the margin, so my point is really one of nit-pickieness rather than a true critique. To its credit, the layout of the book presents the content in a manner that follows the O'Reilly "risen bar" standard.It is easy to scan through the entire reference flipping pages as quickly as possible so that you are able to arrive at your sought information within as much as a second or two.The bold text draws your eye to the page and the size of the page allows one to capture everything in a single glance. In my usage of the book, I found it very accurate and useful.I am a regular MySQL user and the formatting is very familiar to me.I highly recommend this book.If you are already familiar with SQL and the basics of database schema design, this is the perfect reference.I found it amazingly faster than loading the MySQL PDF manual and searching through potentially dozens of hits for the keywords sought.Even at the full cover price, this book is a value-added service at my side. The sections on operators, functions, stored procedures and triggers make this book an invaluable tool for the DBA or programmer who knows the material, but fails to remember every single aspect about the syntax AND who is tired of seeing that familiar: "You have an error in your SQL syntax; check the manual that corresponds to your MySQL server version for the right syntax to use near..." The text also finds welcomed complement from the numerous examples of using commands and SQL keywords.They are invaluable for immediately deciphering the sometimes too-numerous options of a command. I don't know that the book has taught me anything new at this point, but it certainly makes finding the details of what I already know much easier.Because of its brevity and its ease-of-use, it has made me want to play around with some of the various features of MySQL that I do not regularly use.That alone is going to teach me something new sooner or later! If your budget is constrained to a single reference item on MySQL, you can't go wrong with this very portable pocket reference. The back cover says: "When you reach a sticking point, but have to get to a solution quickly, MySQL Pocket Reference is the book you need." I agree completely. 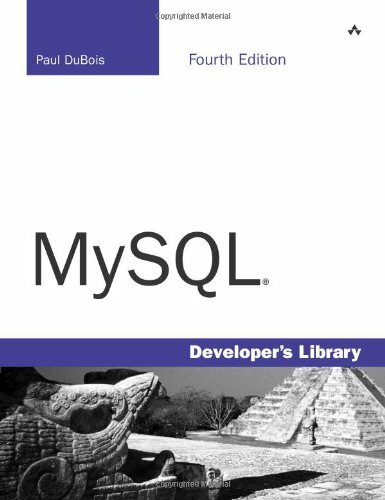 MySQL has gained a lot of functionality after this book was done, but if you are a infrequent developer and like to have a quick reference into basic MySQL functions this book is great. Ben Forta is Macromedia's Senior Technical Evangelist, and has almost 20 years of experience in the computer industry in product development, support, training, and product marketing. Ben is the author of the best-selling Sams Teach Yourself SQL in 10 Minutes (now in its third edition, and translated into over a dozen languages), ColdFusion Web Application Construction Kit, and Advanced ColdFusion Development (both published by Que Publishing), Sams Teach Yourself Regular Expressions in 10 Minutes, as well as books on SQL, Flash, JSP, HomeSite, WAP, Windows 2000, and other subjects. Okay, for the naysayers, this book is imperfect! Good, got that out of the way. I'm in awe of how well Forta has arranged the subject matter, addressing things I needed to know, mentioning things I wanted to learn more about, and generally providing examples of what was most relevant to the current discussion. This is not a Crash Course.This is a textbook, pure and simple, and it earns the distinction. I approve of this book as MySQL by Ben Forta is a great reference as well as hands on instruction. I had the opportunity to hear Ben Forta speak at the University of StThomas about the new COld Fusion 9 which had not yet been released. Great for Begginers. A great reference for the rest. I am not a programmer and when I bought this book I only had experience with Microsoft Access (without knowing VBA). This book was the best way to learn MySQL for someone like me. It is practical, clear and complete enough for acquiring a solid medium-level skills in MySQL. Now that I have those skills, Ben Forta's little book still serves me as a great reference book. So if you want to learn MySQL and have no programming experience don't look further THIS IS THE BOOK FOR YOU! It's important to understand exactly what this book is and is not. It IS a broad introduction to the SQL dialect as available in MySQL. It performs its job satisfactorily. However, you are almost completely on your own when it comes to anything to do with setting up, configuring and problem-solving. For example, when it comes to setting up the example tables, the instructions are extremely sketchy: unless you know that, under Windows, you have to escape '\' as '\\', you will run into problems running the SQL scripts. Similarly, how to start and login to MySQL from the command line using any other account than root is not discussed. These are basic details where any true novice is going to need some handholding. Confusingly, the author refers to 'datasource' which, it seems (it's not explained) is a synonym for 'database'. Thanks to these sorts of lacunae, it was difficult to 'hit the ground running' (author's claim) and you may have to do some googling around before you can get down to business. 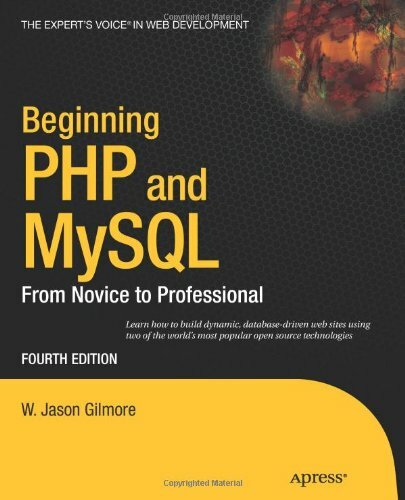 Beginning PHP and MySQL: From Novice to Professional, Fourth Edition is a major update of W. Jason Gilmore’s authoritative book on PHP and MySQL. The fourth edition includes complete coverage of PHP 5.3 features, including namespacing, an update of AMP stack installation and configuration, updates to Zend Framework, coverage of MySQL Workbench, and much more. You’ll not only receive extensive introductions to the core features of PHP, MySQL, and related tools, but you’ll also learn how to effectively integrate them in order to build robust data-driven applications. Gilmore has seven years of experience working with these technologies, and he has packed this book with practical examples and insight into the real-world challenges faced by developers. Accordingly, you will repeatedly return to this book as both a valuable instructional tool and reference guide. This book is almost overwhelmingly thorough, which made it, in my experience, an extremely useful resource in preparing for the Zend PHP certification exam, as well as for learning and daily use. While it's incomplete where the test is concerned-you won't find a listing for "Reflection" in the index, for example-it's a useful reference for most of the material on the exam.All of the built-in string and array functions are described clearly and concisely, with examples of use. PHP installation and configuration settings are laid out in the kind of painful detail expected by the exam. There's an introduction to object-oriented programming,overview of regular expressions and a whole series of chapters detailing some of the most useful features of PHP and reviewing some of the most common problems (web services, user authentication, and secure programming, to name a few). And that's before we reach the second half of the book, providing the same kind of detail for MySQL, including PHPs several interfaces to it. One limitation, from the perspective of an absolute beginner, is the lack of large-scale examples. Gilmore doesn't walk you through the development of a web application; the book is more of a reference text, using smaller examples to illustrate small, specific topics, with the expectation that the reader can assemble those ideas into usable examples. This was probably necessary to enable the chapters to function as individual units, which is one of the book's major strengths. Books of this size can be daunting to a reader. Gilmore's friendly, readable prose goes a long way toward making this one approachable, as does the modularity, allowing a reader to digest only the chapters needed at any given moment. This is an excellent book for learning how PHP works and how you can use it.I used it for assistance with creating my first PHP script.All of the information was very clear and straight-forward, as well as being easy to follow.I highly recommend that anyone that is interested in using PHP and building PHP driven web sites purchase and read this book, because it will be very useful.This is a very well written book and is an excellent resource. I needed to learn PHP and MySQL quickly. It is hard to know which book and which author. So why did I pick this book? And why do I recommend it? The structure outlined in the book's table of contents, a quick look at Jason's website (chock full of useful information) and the fact that this is an Apress book quickly cemented my confidence. I received the book earlier than expected. I literally devoured the 1st 18 chapters in an afternoon following the installation of a MAMP environment. I believe that this is a testimony to the clarity of the writing, the structure, and the examples. I typed most of my own and only downloaded the source code from Jason's site later. I highly recommend registering on the [...] site. I had registered for a PHP and MySQL course prior to purchasing the book but didn't start it until after chapter 20. This book helped me accelerate my website development and made the class super easy. I probably could have saved the course cost and just used the book. I strongly recommend this book. Thus far I have found a consistent level of quality authors at Apress. I have several books on MySQL on my desk at work, but I have learned to go to this one first when I need an answer to a specific problem. It covers everything from from syntax to concepts. It is thorough and gives enough information to get the job done, but not so much as to be overwhelming. I think this is one of the better technical books I have encountered in many years, and highly recommend it to anyone who needs to actually get into the inner working of a MySQL database. I have work as a DBA since 1993 and with Mysql for the last 9 years, and I have to say of all the DBA books that I have read, this is the best on the market at this time. The book is well written, Sheeri Cabal has hands-on experience working with Mysql, and it shows. Sherri is also no stranger to the Mysql community. My hat off to the authors for a job well done. 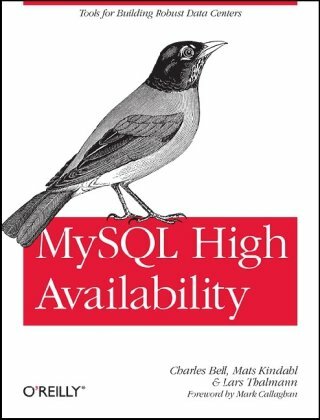 In regard to the lone negative review of this book, if you have good experience working on other RDBMS but is new to Mysql, you should be able to make use of this book, if you have no experience with RDBMS, this is not the right book for you. "The book you need to succeed!" I must say, I do agree. Authored by two very experienced DBAs, Sheeri Cabral and Keith Murphy, they've combined their talents to cover what you really need to know to succeed. This book is very versatile. If you're new to MySQL, or experienced in another database and have to start administrating MySQL, you need this book. I can honestly say, even if you have years of MySQL experience, you will learn something new. I did. Divided into four parts, MySQL Administrator's Bible covers your First Steps with MySQL, Developing with MySQL, Core MySQL Administration and Extending Your Skills. First Steps with MySQL starts with a gentle introduction to MySQL with company information, which seems to be changing annually, and most importantly, the MySQL community itself. What makes MySQL so fantastic is the community. After that, you'll be lead into installing and configuring MySQL on various platforms including Linux, Windows and Solaris while touching on post installation configuration too. Basic security is covered as well as some tips on troubleshooting and accessing your new MySQL installation using tools included with MySQL or using third party software. Developing with MySQL covers the MySQL Language Structure and if you're coming from another RDBMS, it covers how MySQL deviates from the SQL standard by extending that standard to make MySQL the number one open source database used on the Internet. After that, this section covers the same type of topics covering just about any other mainstream databases such as using stored procedures, cursors, events, views and transactions. The Core MySQL Administration is the heart of this book. It covers MySQL server tuning, covering all major storage engines including MyISAM, InnoDB, Falcon, PBXT, and NDB engines including the first time I've seen in print, the Maria storage engine. An entire chapter is devoted to implementing cache tables and using the query cache. Memcached is also mentioned, and mentioned again in the final section. Continuing on with what I consider the most important job of a DBA, backup and recovery. Databases are very central to running a business, any data loss could put a company out of business. Be prepared. This section gives a solid introduction to the topic of dealing with users, and how they are managed within MySQL. Count on covering GRANT/REVOKE, using SHOW GRANTS and mk-show-grants MaatKit tool. Partitioning, logging and replication and measuring performance rounds out this section. If you have experience with another RDBMS, plan on spending a significant amount of time in this section. Not that the other sections aren't important, they are, but this is the bread and butter of what a MySQL DBA does on a daily basis. Extending You Skills section can be considered getting your Masters in Database Administration. Just about every DBA will have to tackle improving queries and the tuning of indexes. The second most important job of a DBA is monitoring performance of your MySQL server. Don't let your users be your first line of monitoring! Be proactive, there are plenty of open source monitoring tools available. The most popular are discussed, as well as MySQL Enterprise and third party companies too. MySQL Data Dictionary is covered in in detail over 58 pages. This is the most I've read in any book about the data dictionary. Last but not least, most high performance MySQL systems involve scaling up or out. It covers the usual suspects of replication, MySQL Cluster, and memcached. MySQL Proxy is initially covered and has an appendix to expand on that information. MySQL Proxy itself is worthy of its own book. (hint, hint :) ) Two more appendices cover MySQL Functions and Operators, and additional resources. 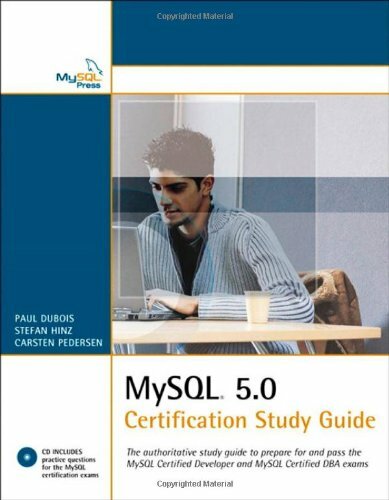 Even though this book targets MySQL 5.1/6.0, there is plenty of information that will apply to 5.0. If you're still on 5.0, don't hesitate to pick up a copy. This will be a book that can stay with you as your upgrade to 5.1 and beyond. The companion website - [...]contains all the code from the book too, rounding out this fine tome. What didn't I like about the book? There are only a couple of things, all personal I'm sure. First, I really don't care too much for tables of options from the various tools. Most open source tools are developed rather quickly and options change. This could render portions of the book out of date quickly. The other thing I noticed that wasn't mentioned in the book was the community versions of MySQL supported by Open Query and Percona. The latter has their own storage engine, XtraDB and backup solution, XtraBackup. All in all, this is a very solid book on administering MySQL. This book digs deeper, the experience of the authors really show. Well done Sheeri and Keith! 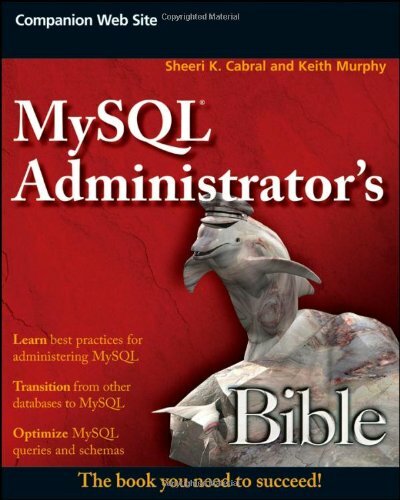 Disclaimer: The publisher provided me with a copy of MySQL Administrator's Bible. This is a comprehensive reference guide to MySQL that's accessible to beginning DBAs or DBAs familiar with another database. It has enough detail to be a useful companion throughout a DBA's career. It also covers many related technologies, such as memcached, at a moderate-but-useful level of detail. This isn't exactly a how-to book, and it isn't exactly a reference manual; it's more of a blend of the two. The audience will depend on personal preferences. Some of the reference material is the type of thing I would look up with command-line --help options or the MySQL manual. But there are times when the reference aspect of the book is uniquely valuable. For example, the online documentation tends to list things alphabetically; the book might break them down into groups by function. An example is the sql_mode parameters, which it groups into categories like "Getting rid of silent failures, silent conversions, and silently allowing invalid data." The book is divided into four parts: first steps, developing with MySQL, core administration, and a set of chapters and appendixes grouped under extending your skills. I think this organization works well. Coverage is for MySQL 5.1 and 6.0. As far as I know, this book contains the most complete coverage of MySQL 5.1 in print. 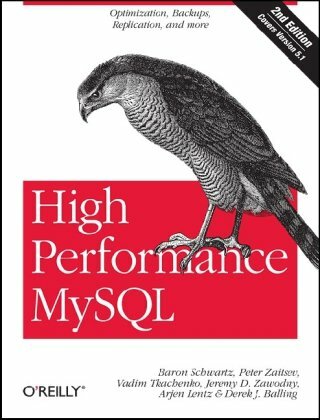 By the way, I'm the lead author of High Performance MySQL: Optimization, Backups, Replication, and More and I think the two books are very complementary.If you're new to MySQL, then start with this book, and later you might consider reading mine as well. Some background first: I've used MySQL for two decently-sized programming projects in the past, on the developer side. More recently I was hired to design, build and administer the back-end of a web application. MySQL seemed the natural choice. With background only in the developer's role, I had a huge amount to learn. The former was pretty terrible, and it's all available online anyways so there's absolutely no reason to buy it. Why is it so bad? Despite being written by MySQL, it is completely impractical and totally bogged down with details. I defy you to figure out how to efficiently back up your database by using that guide. I couldn't. The latter was very useful for introducing concepts like data normalization and, while a little out of date, gives a quick sense of the products that are out there. I highly recommend it as a first read. but it's not MySQL specific - so where to go then? Finally, I found this book. It took me about 1 minute to find the tools I would need to back up a database and another 10 seconds to find a detailed discussion of what's going on when you back up a database. It's also very recent (as of 2009/06) - it really reflects the state of the tools out there and I was pleasantly surprised to find that all of the developments I had been reading about in my online research were reflected in the book. Instead of glossing over complex topics like MySQL Cluster, memcached, DRBD, Linux HA (see, I wasn't kidding about its coverage), it points you to external resources that are actually helpful. I haven't yet read all of it but, to my knowledge, there is nothing comparable out there. If you have a good idea of the basics behind database administration and need a practical guide to how to actually administer a MySQL database, including the tools available to you, I'd seriously recommend that you take a look at this book. - I was a bit concerned about the book's information on early-stage tools like MySQL Proxy and MySQL 6.0. They haven't been released for general use and are not certified as stable, but the book just lists them with other tools as if you could just drop them in. Be careful. Along with MySQL's popularity has come a flood of questions about solving specific problems, and that's where this Cookbook is essential. Designed as a handy resource when you need quick solutions or techniques, the book offers dozens of short, focused pieces of code and hundreds of worked-out examples for programmers of all levels who don't have the time (or expertise) to solve MySQL problems from scratch. The new edition covers MySQL 5.0 and its powerful new features, as well as the older but still widespread MySQL 4.1. 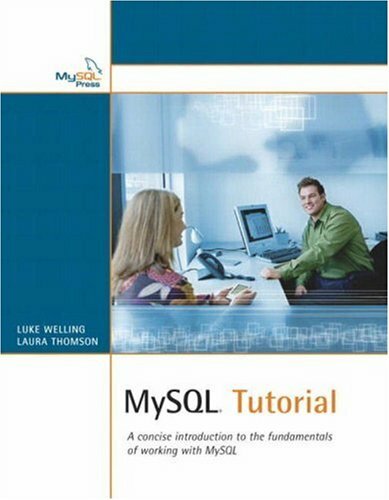 One major emphasis of this book is how to use SQL to formulate queries for particular kinds of questions, using the mysql client program included in MySQL distributions. The other major emphasis is how to write programs that interact with the MySQL server through an API. You'll find plenty of examples using several language APIs in multiple scenarios and situations, including the use of Ruby to retrieve and format data. There are also many new examples for using Perl, PHP, Python, and Java as well. MySQL Cookbook doesn't attempt to develop full-fledged, complex applications. Instead, it's intended to assist you in developing applications yourself by helping you get past problems that have you stumped. Good programming--which is to say, programming that yields both efficient code and a profitable life for the programmer--depends on not reinventing the wheel. If someone else has solved the problem you're facing (and someone almost always has), you'd be foolish to waste your energy figuring out your own solution. MySQL Cookbook presents solutions to scores of problems related to the MySQL database server. Readers stand a good chance of finding a ready-made solution to problems such as querying databases, validating and formatting data, importing and exporting values, and using advanced features like session tracking and transactions. Paul DuBois has done a great job assembling efficient solutions to common database programming problems, andteaches his readers a lot about MySQL and its attendant APIs in the process. My son the computer tech was right--once again. I need to learn about MySQL for my small business. My son the computer tech said this was the book I needed to get me up to speed quickly. He was right. It's concise, apparently complete, and easy to understand, even if the subject is a bit mind-bending at times. Without a book like this, I wouldn't enjoy the learning experience; it would be less pleasant than another knee surgery. This book is highly recommended by a guy who has read a lot of instructional material in a 40-year career that included service as a part-time college instructor...and by his adult son whose computer library cost his dad thousands of dollars. 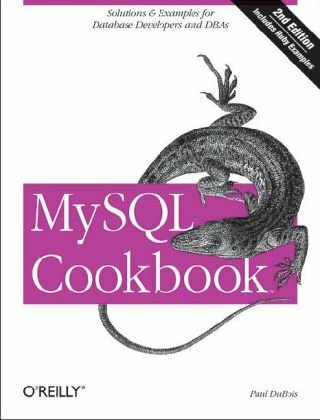 I really enjoy cookbooks because of their no nonsense organization.This MySQL book exactly fits that description.Chances are just scanning the table of contents you'll find the question you are asking with the answer and explanation at your fingertips. Nuggets of information I found quickly include: paging producing HTML output with the mysql client, checking and changing a tables storage engine, working with fulltext searches, summary and grouping query examples, importing data from CSV, exporting in various formats, dealing with auto_increment columns, sequences, deletes, gaps, and so on.Also handling duplicates, detecting, eliminating, working with transactions, and a whole lot more. The book is mainly geared towards web applications and MySQL.The languages that they cover include Perl, Ruby, PHP, Java, Python.If you're using any of those languages for your web application, it is more than likely you want a copy of this book.It's very quick and painless to lookup how to do something, and not have to wade through tons of information that's not relevant to you. The target audience for this book is really developers not DBAs, so keep that in mind.If you're doing web development in Ruby, PHP, Perl, Python or Java, you should consider this book.It concentrates solely on the how to do specific things, so you won't get weighed down by too much theory and so on.With that in mind, it's not per se a book on performance, testing, benchmarking and profiling applications in those languages, so if that is what you need, you'll require additional material. At 900+ pages this book addresses a lot of common SQL tasks. And that's what a good cookbook should do. Not only does it present the SQL queries in the MySQL dialect, it also covers how to pump those queries through Pearl, Ruby, PHP, Python, and Java APIs. As an added bonus you can actually use this book to learn SQL. I thought the chapter on JOINS was especially well written. The cookbook is a powerful tool to those who know some mysql, and some dB design. I recommend that you use another book to learn basic mysql (or just an online tutorial), and another to learn database design (Navathe). As indicated, this book is true to its title.It is a cookbook, by which I mean it contains a great number of (generally useful) recipes of varying complexity, but lacks detail and analysis that a more focused text would have. Mr. DuBois and O'Reilly publishing are clearly targeting a wide audience: the recipes range from frighteningly simple (e.g. 3.1, Specifying Which Columns to Select) to fairly sophisticated (e.g. 12.14, Performing a Join Between Tables in Different Databases).The recipes are typically clearly written, with ample supporting code examples and few typographical errors. I must also note that Mr. DuBois nicely avoids a pitfall many authors (the competence of whom I have to question) in this genre encounter: failure to weave security considerations into the text.While other books often mention security as an afterthought, or worse include code examples featuring disasters like non-escaped strings (hello, SQL injection! ), DuBois explicitly points out the need to sanitize input and writes code examples that demonstrate the use of prepared statements in best-practices. When you need to find the right SQL keyword or MySQL client command-line option right away, turn to this convenient reference, known for the same speed and flexibility as the system it covers so thoroughly. MySQL is packed with so many capabilities that the odds of remembering a particular function or statement at the right moment are pretty slim. With MySQL in a Nutshell, you get the details you need, day in and day out, in one concise and extremely well organized book. The new edition contains all the commands and programming information for version 5.1, including new features and language interfaces. It's ideal for anyone using MySQL, from novices who need to get up to speed to advanced users who want a handy reference. Like all O'Reilly Nutshell references, it's easy to use and highly authoritative, written by the editor of the MySQL Knowledge Base at MySQL AB, the creator and owner of MySQL. Whether you employ MySQL in a mission-critical, heavy-use environment or for applications that are more modest, this book puts a wealth of easy-to-find information at your fingertips, saving you hundreds of hours of trial and error and tedious online searching. If you're ready to take advantage of everything MySQL has to offer, MySQL in a Nutshell has precisely what it takes. I don't think a long, comprehensive review is needed here. This is a quick reference guide to have handy when you're working on a project or whatever. You won't learn MySQL from it but as long as you are already familiar with it, it serves as a great, quick reference, especially when you are utilizing keywords or routines that you don't normally use and therefore don't have in the forefront of your mind. If you need a bit of a field refresher, this works great! The layout is good, separation of data is intelligently laid out and the writing is solid.If you are a MySQL developer or admin that is looking for a resource by your side at all times this is a great book to have!! It does not cover MySQL 5 or later. It's a great reference but dated. If I had known that it only covers through version 4, I would not have purchased it. MySQL and how to use it effectively! The book is "A Desktop Quick Reference" just as billed on the cover.It is explicitly MySQL-centric and doesn't stray from that core message.It is extremely up-to-date considering the rapidity of movement in MySQL development progress. I feel that its author, Russell Dyer is the kind of person who is easy to talk to and immediately be comfortable with based on his style and presentation in this book. The content of this book is very well organized in keeping with the finest traditions at O'Reilly & Associates.There is an installation guide, tutorial, SQL syntax reference, MySQL built-in functions section(s), command-line utilities reference and programming languages API references for PERL, PHP and C.These API references demonstrate commonplace MySQL usage through clear, easy-to-read examples that make good sense. It is a very comprehensive text that reads as easily as a favorite novel yet is concise enough to be your first "go-to" on MySQL issues you may face day-in and day-out.It is truly the "most advanced kingfisher" (cover animal) on the topic and, like the Pied kingfisher, it is lightweight and demonstrates keenly honed survival skills. I use MySQL daily and I find it very useful and enjoyable.I don't want to become an SQL guru or even a DBA, as a programmer, I enjoy having MySQL In A Nutshell close at hand so that I can focus on writing code.Thank you Mr. Dyer (and the folks at O'Reilly) for a job well-done!I heartily recommend it to everyone using MySQL.The convenience of this publication clearly outweighs its cost.Newcomers and RDBMS "old-timers" will appreciate this book equally. Ah, "Nutshell" books - you gotta love `em. Or maybe you don't. I won't get into the pros and cons of online documentation versus books because this subject has been rehashed ad infinitum. Truth is, there are pros and cons for both, and we each have our own reasons for our own preferences. That being said, if you like book documentation - and "Nutshell" books in particular - then you will like this book. I happen to think it is a good idea to tear yourself away from the keyboard/screen every once in awhile, and the "Nutshell" books give you a good reason for doing so. I'm not a SQL expert, so I liked the tutorial-flavored introductions at the beginning of each chapter, followed by the conversational tone of the clear and concise examples. I did not have this book when I first started programming using MySQL, and that's too bad because it could have saved me a lot of wasted time with its explanations of some of the more nefarious "gotchas" of the language. Criticism: The following APIs are covered at the end of the book: Perl, PHP, and C. I can see leaving out COBOL and Lisp (if there are even APIs for these languages), but Java? Granted, the Java interface to MySQL is well-documented in many places, but if you are discussing the *major* programming language APIs to MySQL then you should do just that. The implementation of stored procedures in MySQL 5.0 a huge milestone -- one that is expected to lead to widespread enterprise adoption of the already extremely popular MySQL database. If you are serious about building the web-based database applications of the future, you need to get up to speed quickly on how stored procedures work -- and how to build them the right way. This book, destined to be the bible of stored procedure development, is a resource that no real MySQL programmer can afford to do without. In the decade since MySQL burst on the scene, it has become the dominant open source database, with capabilities and performance rivaling those of commercial RDBMS offerings like Oracle and SQL Server. Along with Linux and PHP, MySQL is at the heart of millions of applications. And now, with support for stored procedures, functions, and triggers in MySQL 5.0, MySQL offers the programming power needed for true enterprise use. MySQL's new procedural language has a straightforward syntax, making it easy to write simple programs. But it's not so easy to write secure, easily maintained, high-performance, and bug-free programs. Few in the MySQL world have substantial experience yet with stored procedures, but Guy Harrison and Steven Feuerstein have decades of combined expertise. A companion web site contains many thousands of lines of code, that you can put to use immediately. Guy Harrison is Chief Architect of Database Solutions at Quest Software and a frequent speaker and writer on MySQL topics. Steven Feuerstein is the author of Oracle PL/SQL Programming, the classic reference for Oracle stored programming for more than ten years. Both have decades of experience as database developers, and between them they have authored a dozen books. Great book, excellent explanation, covering the very advanced usage and power of Stored Procedures capability in order to bring greater efficiency of application. Very clear style of writing, good examples with a detail explanation. This book clearly covers stored procedure programming well.Of course, it goes over basic syntax and provides examples, but it also goes much farther than that.This book discusses optimization of MySQL queries regardless of the use - in or out of sprocs.It also did a very nice job of discussing the use of cursors - the ability to iterate through the results of a query without being pelted with the entire result set all at once. If you're developing on MySQL 5 or greater, and you're serious about letting the database handle things that make sense (i.e. denormalization, administration, and putting business logic into the database), this is an excellent resource. o Demonstrates use of stored procedures with languages like PHP, Perl, Java, and others. o Title doesn't do it justice. This is the first and only book about Mysql stored procedured and since it was written by the query tuning guru Guy Harrison, it also includes nice tips on query tuning. Highly recommended, just be forewarn that this is for advance Mysql developers or DBA only. Also, be aware that Mysql stored procedure as of release 5.0 and 5.1 won't buy you much performancesince Mysql parse stored procedures scripts every time it run unlike other RDBMS like Oracle and MSSQL. If you want better performance,you should make use of prepared statements inside a stored procedure. I have been working with MySQL for several years as a database back-end for Java, Ruby and C# programming projects. After upgrading to version 5, I have been meaning to look into MySQL's support for stored procedures. 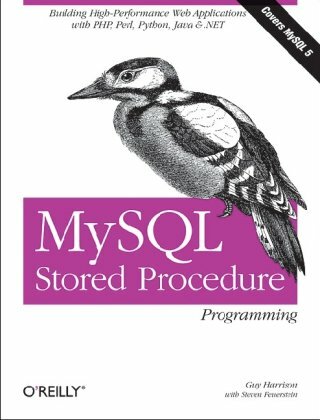 The MySQL Stored Procedure Programming book was my first read on the subject and I found it quite useful. It covers not only stored procedures, but also functions and triggers, collectively called 'stored programs' in the book. While there are many books on MySQL, this book is dedicated to the stored programs domain and provides a lengthy treatment of the subject. During the introduction, the authors provide a veritable laundry list of MySQL resources including many books and websites. The basic tools for creating stored programs in MySQL are visited and help set the groundwork for a 'read, type in the example and run it' feedback loop. Throughout the book, the examples are clear and easy to follow. The introduction is followed by a brief tutorial, highlighting stored procedures, functions and triggers. What follows is two sections of chapters, over 200 pages in length, diving into the details of the stored procedure language fundamentals, blocks, conditional statements, iterative programming, error handling, the creation and maintenance of stored programs, transaction management, MySQL built-in functions, stored functions and triggers. The next section of the book is of particular value to software developers that use MySQL in their applications. Over 150 pages showing you how to use MySQL stored programs from PHP, Java, Perl, Python and .NET. The Java section even shows the basics of using stored procedures with Hibernate and Spring. After that, you'll be greeted with a 110 page medley of options to help you optimize your MySQL stored programs. The subject of tuning your SQL is addressed over the course of three chapters, from basic through advanced tuning topics. Additional optimization techniques such as reducing network traffic with stored programs, optimizing loops, recursion, cursors, trigger overhead and more are found in the final chapter of this section. The book closes out with a chapter on best practices in MySQL stored program development. MySQL Stored Procedure Programming has earned a space on the MySQL shelf of my technical library. It's a fine book that will help you take your MySQL programming experience to another level. The good:I found to book to be generally useful. The approach the book takes is good. Lots of examples are provided along with a good amount of explanation. If you want to build dynamic Web sites that encourage users to interact with them, PHP and MySQL are among the best tools you’ll find. PHP is a scripting language designed specifically for use on the Web, while MySQL is a database management system that works with it perfectly. Best of all, they’re free. It’s hard to beat that combination! PHP & MySQL Web Development All-in-One Desk Reference For Dummies is kind of one-stop shopping for the information you need to get up and running with these tools and put them to good use. It’s divided into six handy minibooks that cover setting up your environment, PHP programming, using MySQL, security, PHP extensions, and PHP Web applications. They make it easy to create a Web site where visitors can sign on, use shopping carts, complete forms, and do business with your business. 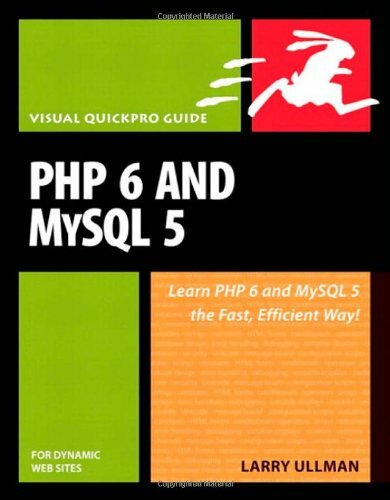 I got this book for a class in PHP and MySQL, and it has proven extremely helpful.It is very clear and easy to understand.I highly recommend it for beginners in PHP. I am new to PHP programming and I like the way the book explains the good stuff and the bad stuff and even shows examples of both typs and explains what really happens. I had a lot of expectations from this book as it was a branded 'For Dummies' book, but alas from the beginning of Chapter 2 onwards, typos and mistakes start appearing thick and fast; And we're not talking about mistakes in English here either, we're talking actual mistakes in the printed code, and in the associated explanations of the printed code, which frankly, if you are a beginner and not able to discern that it's a mistake, is a fundamentally suicidal mistake for a reference book to make.Luckily, I'm quite smart (yay! ), and so I was able to terminate my reading experience after only 130 pages and get something else.Avoid this book, as it will only tarnish your learning experience.Quite sad really. A collection of small writings slammed together to create a rather thick tome and none of the sections go into sufficient depth to really teach much. I'm sorry, but after going through just the first couple chapters in Book II, I've already encountered many mistakes in the reading. I enjoyed the Java book I read by this publisher, but this one clearly wasn't proofread or something because there is misleading text, and coding that might confuse anyone brand new to programming. Luckily, I only checked this out from my school library because I would have been quite disappointed if I spent money on this book to only find it with many mistakes in the first couple days of my reading. Although MySQL's source code is open in the sense of being publicly available, it's essentially closed to you if you don't understand it. In this book, Sasha Pachev -- a former member of the MySQL Development Team -- provides a comprehensive tour of MySQL 5 that shows you how to figure out the inner workings of this powerful database. You'll go right to heart of the database to learn how data structures and convenience functions operate, how to add new storage engines and configuration options, and much more. Understanding MySQL Internals provides unprecedented opportunities for developers, DBAs, database application programmers, IT departments, software vendors, and computer science students to learn about the inner workings of this enterprise-proven database. With this book, you will soon reach a new level of comprehension regarding database development that will enable you to accomplish your goals. It's your guide to discovering and improving a great database. The book was for a son.It arrived very quickly and in perfect condition. purchased this book and it is excellent!Wish we had it months ago. architecture, file and subsystem layout.Also provides great information on using the 'built in' debug capability of the server -- very useful! on the mark for those folks interested on working on server internals. An excellent overview of the MySQL codebase, philosophy, and the design decisions that have made MySQL what it is today. Even though I have never touched the MySQL source before (it can be a daunting beast for the uninitiated), Sasha's explanations made me comfortable with the 'internals' and finally lifted the 'magic veil' off the engine. 'MySQL internals' has a perfect balance of high-level explanations, and low-level code samples to help you understand the inner workings of the database. After reading this book you should be comfortable enough to tackle the source, and you'll also have deep understanding of the storage engines and how to configure them, how the query parser works, how the optimizer decides on the execution plan, and much more. This is a must read for any DBA, or a programmer who wants to see a great example of a high-performance, reliable UNIX server. Sasha knows the mysql code well, and he has done a fantastic job of presenting it.This is an important book for anyone who would like an enhanced understanding of mysql, including DBAs who might need a detailed understanding of locking or replication to.And it's a must-have for anyone working on a storage engine. A concise introduction to the fundamentals of working with MySQL. MySQL is an open-source relational database management system that is rapidly growing in popularity. Known for its speed, reliability, and ease of use, MySQL has proven itself to be particularly well suited both for beginners and for experienced developers to create sophisticated database-backed Web sites and applications. MySQL Tutorial is a clear, concise introduction to the fundamental concepts and techniques of working with MySQL. It teaches the beginning MySQL user how to create and administer powerful databases that can be used at home, at work, and on the Web. I needed to get up to speed pretty quickly on MySQL. From the point of ordering this book until it arrived, I had already figured out 80 percent of the material the book covers, on my own. I am a fan of printed material. All of the information here is available on the Net, but it is sometimes good to have a handy reference with all the material in one organized spot. It would also be good for a class of beginners, which I think this book is used for, too. It didn't cost a lot and I'm happy to have it to grab from time to time, but I just got a real "blah" feeling flipping through it, as I felt like I knew everything it covered already. 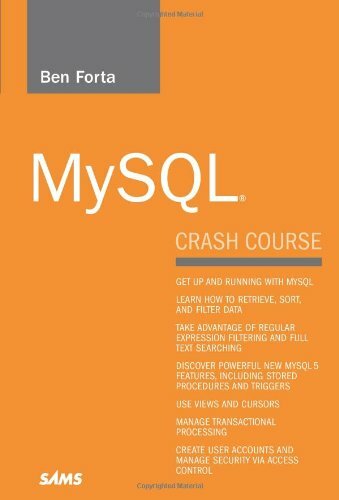 This book is a very good basic overview of what MySql can do -- it gives you a little bit of information about a broad range of topics.So while the book is a good "survey course" in MySql, you will need to use additional sources to get into more complex features of MySql. This relatively small 270 page book is packed with information you need to know if you work with MySQL databases.I'm impressed with it's efficiency and conciseness and use it as a reference all the time. If you work with MySQL databases you'll love this book. Why Aren't All SQL Tutorial Books Like This? I'm looking at you, Microsoft Product Writers, although you're certainly not alone.In 240 pages and 2 days I learned, easily comprehended, and retained more about the fundamentals of a SQL server than I ever did reading many of those "Introduction To..." behemoths. The book starts with introducing you to both the product as well as database design and efficient database/table creation.Following this is an excellent overview of using MySQL and the MySQL-flavor of SQL focused on language (query language keywords, functions, etc), table types (MyISAM, InnoDB, etc), and transactions.You're reading is concluded with an excellent overview of general administration and optimization.Each section is broken down into discussion, fully-functional examples, a quiz, and to-do exercises, ensuring that you get to implement and solidify the skills you just acquired. At the time of my writing this, the book is 4 years old, and the version of MySQL it addresses (4.x) has already been upgraded.I knew that when I purchased the book, and it doesn't matter as the fundamentals haven't changed.MySQL may have released improved GUI tools to accomplish many tasks as well as introducing additional features, but the underlying SQL language, design methods, and structure is the same, and knowing/understanding the fundamentals improves your efficiency and makes using the product easier. As the purpose of this book is to teach you the fundamentals of database design and creation, this will not be your last purchase.But for those new to MySQL, you can not go wrong starting here, even now. Luke Welling and Laura Thomson have the special gift of taking information, disseminating it, and making it simple to understand for everyone. This is the second book I bought from these authors (Php and MySQL Web Development) without any complaints. It is nice to see books of this size (250 pages) at this price point coming out. Nothing is worse than those large tomes that weigh a ton and cost an arm and a leg. You should be able to get through this in a week, which is perfect for busy professionals. This tutorial is written very clearly and does what I want from it - nail down the 80% of the necessary information needed to get work done. After each chapter there is a quiz to test your knowledge. The authors tackle both the user and administrator side of using the product. One of my favorite sections in the book is the Database Crash Course which discusses normalization.